See how a communication upgrade cleared the way for a more streamlined workflow. Truman Medical Centers (TMC) wanted to optimize efficiency in its facilities. With two inpatient facilities with 600 beds, 51 clinics and more than 4,000 employees—TMC nurses were carrying up to five devices just to facilitate routine patient care at bedside each day. A new approach to care team communications was needed. 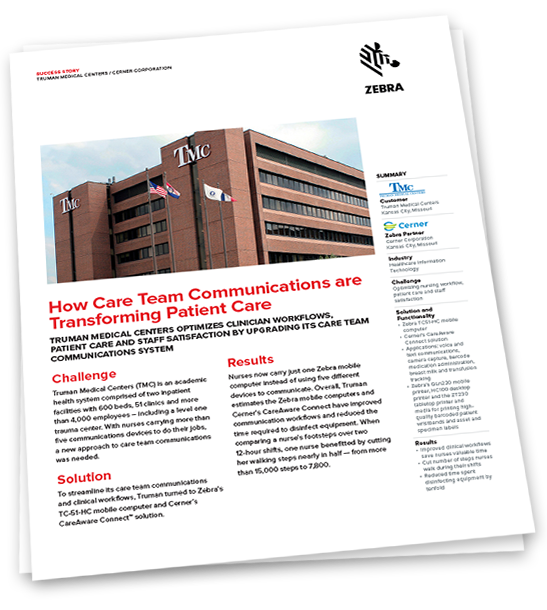 Watch the video to see how Truman Medical Centers and Zebra worked together to make this transformation easy. Complete the form below to get instant access to Truman Medical Centers' success story.